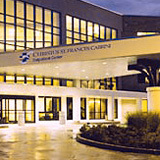 To learn more about CHRISTUS St. Francis Cabrini Hospital, please click here. Alexandria is a city in and the parish seat of Rapides Parish, Louisiana, United States. It lies on the south bank of the Red River in almost the exact geographic center of the state. It is the principal city of the Alexandria metropolitan area (population 153,922) which encompasses all of Rapides and Grant parishes. Its neighboring city is Pineville. In 2010, the population was 47,723, according to an official estimate by the College of Business Population Estimates Program at Louisiana Tech University. Located in the heart of Louisiana, Alexandria is quickly emerging as one of the nation's best places to start a business, raise a family, and explore the great outdoors. It is a national leader in new and expanded business development and was recently named one of the twenty best cities in the country to find a job. National Geographic Traveler ranks Alexandria as one of America's top ten "wilderness towns" because of its incredible access to the one of the country's most beautiful and expansive national forests. Central Louisiana has become known as "The Crossroads," a place where all of Louisiana comes together - from culture to food and music. With a population of over 46,342, Alexandria continues to grow in every sector of our society. Today, the city and the area have changed. Cleco, Procter and Gamble, Union Tank Car, and Dresser Valve Works are just a few of the large corporations that have chosen to call Central Louisiana home. The Red River is now navigable thanks to the Red River Waterway Project. The $1.9 billion Red River Waterway Project, authorized by Congress in 1968, added a series of five lock and dam complexes to the river. These structures perform a stair-step effect on the river, creating controllable pools and passageways for river traffic. Central Louisianas work in several industrial sectors, with the largest being education, health and social services, followed by retail. Closely trailing behind retail are construction, manufacturing, public administration and the arts, entertainment, recreation and hospitality sector. Timber and Forestry products remain the #1 crop for this area. Cotton, Sugar Cane, Sweet Potatoes, Corn, and Soy Beans are also being farmed.